This week I plan on sharing a few unique yo-yo craft projects. 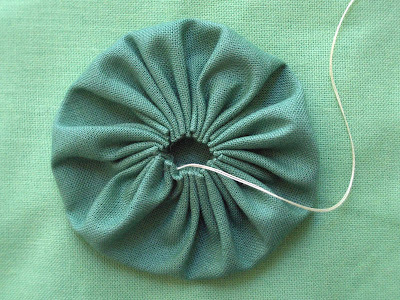 But first, I thought I would share how to sew a basic yo-yo. This technique was first shown to me by my Grandmother and I've been making them this way ever sense. There's something about making yo-yo's that's very therapeutic or zen like. They also make for great projects to take along with you on the bus, at the park, etc. With the geometry compass draw a circle with a 5 inch diameter onto the cardboard. 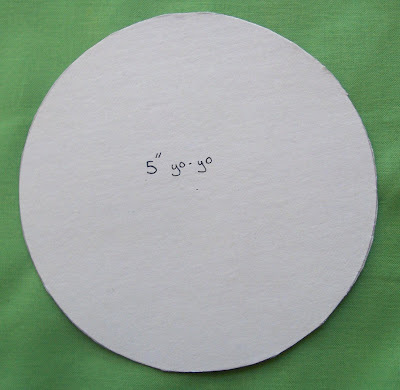 If you don't have a geometry compass, try using a small plate or saucer to trace a circle. It' s okay if the circle isn't 5 inches in diameter. You'll just end up with a larger or smaller yo-yo depending on the size of your plate. Cut out cardboard circle. Trace the circle onto fabric. Cut out circle. With the wrong side of the fabric facing up, fold the edge over about 1/4". 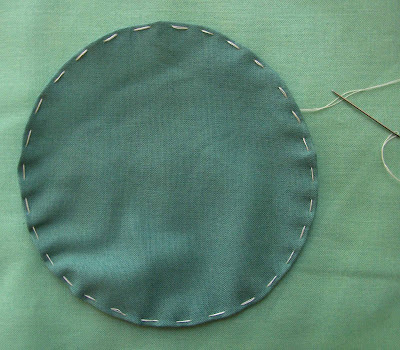 Using a running stitch, sew around the entire circle close to the fold (refer to picture). This is what your yo-yo should look like once you stitched all the way around the circle. This is what the back (right side of fabric) will look like. With the needle still on the thread, pull the thread tightly so the fabric cinches together. This is why you need strong thread, to keep the thread from snapping. Flatten and shape the yo-yo. Run the needle through the center back of the yo-yo and tie off. Done! You now have made your first yo-yo! 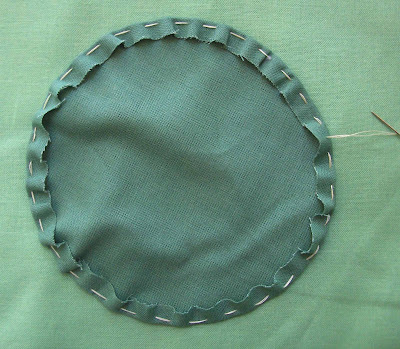 You can change the size of the hole and gathers by adjusting the size of your stitches. 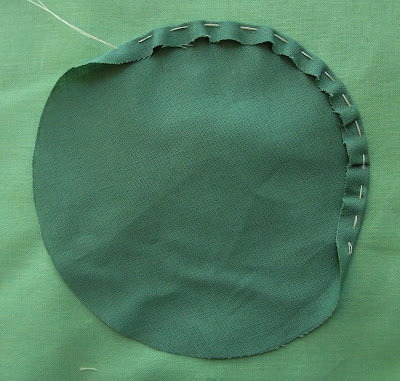 For example, larger stitches will yield a smaller hole. You can also buy yo yo makers which help guide your stitches. There are even heart and flower shaped yo-yo makers you can purchase. 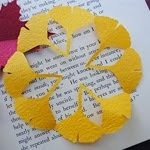 I want to try to make these! I have seen them around, and I keep meaning to make some but I never do! They look so easy! Probably harder for me than most people though! Oh, how I love yo-yo's. I can't wait to see what you are going to make with these. what will you make with these? 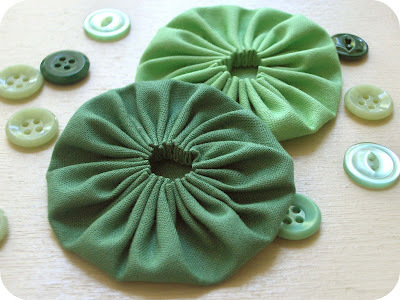 i was thinking about making one and putting a button in the middle and a clip on the back for a hair bow, but is there something specific you use then for? i would love to know. Never thought of that...you have some bizarre ideas sometimes Jessica! That´s our FUXICO around the world. At Brazil people do it since I don´t know when. Yo-yo's are most commonly used for quilts. However, I'm planning on posting a few unconventional projects with them. Come back through out the week to see. Thanks for the easy yo-yo tutorial. I've seen those things you can buy to make them, but who needs that when they're so easy?!? I made my first batch today at lunch. Thanks! Thank you for your tutorial. 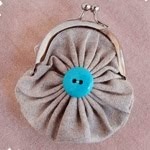 I just used it to create a yo-yo for a purse I was making. Thank you so much for this very straightforward tutorial! I have been wanting to make yo-yos for some time now and have finally made two in the space of 20 minutes by following your tutorial! vou fazer todos esses fuxicos. 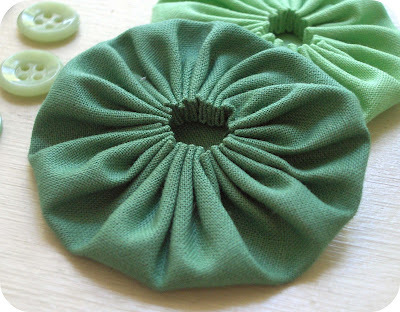 I just found your tutorial, and used it to make a couple of yo yos for a hair clip! Thanks! best site I found on how to make the yoyos. The tip on the strong yarn was brilliant. This is a great tutorial. For some reason I have read tohers about the yoyo's and didn't understand. But I understood yours. Thanks! I added your tutorial to my link love today. I love these bracelets! I'm going to try to make my 4 granddaughters one each. Thank you for the tutorial and the idea! Great tutorial! 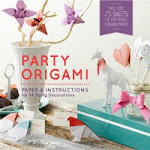 I am going to share it on my blog at Happy Accidents Happen. I made an adorable summer dress for my daughter using yo-yo's for the embellishments! Thanks!